Spend a day with the Workings -all three generations – as they explore what it takes to create lasting partnerships in the ever changing world of technology. Having a great technology is not enough. In today’s world of competing technologies – the company with the best partners in taking a product to market win. But how do you create partnerships that last? Partnerships that take your product and build it into solutions that make customers want to buy? 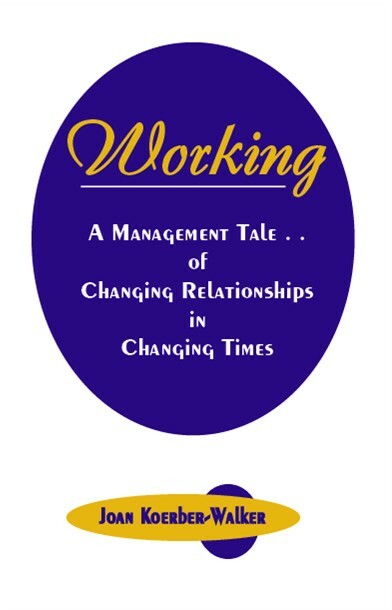 In Working: A Management Tale of Changing Relationships in Changing Times (2004, CorePurpose Publishing, ISBN: 0-9747056-0-8, $19.95), author Joan Koerber-Walker introduces us to the Workings, their family, friends, partners, and co-workers. Everyone has gathered to celebrate the 95th birthday of patriarch and company founder Kyle C. Working. As they come together, they explore change, relationships, and what it takes to build partnerships that last generations. Unlike more traditional business books, Working is a story. Fictional characters share their experiences and lessons with the youngest of the Working family, the third Kyle C. Working. Companionable dialogue and repartee between the characters delivers the tale’s messages about the secrets of lasting partnership and long term success. 1) To build a business that lasts generations you need to recognize opportunity and change. This applies both the to the company and the leaders who steer its course. One of the patriarch’s favorite sayings “when fate throws you a tow rope, grab on and enjoy the ride.” is a theme that recurs throughout the story. Each generation is given the opportunity to take the company in a new direction. In generation one – its creation. For the second generation – its expansion. As we look to the third generation – what new opportunities are on the horizon? 2) Successful business partnerships are a lot like getting married. You look around for the most attractive partner you can find. In the courting phase, you check each other out to determine the right fit. By the time you make it legal, you are setting expectations, making promises, setting goals. Over the life of your relationship, you learn to work with each other, to compromise, and to adjust so that each person is getting what they need. Like a marriage – lasting business partnerships are personal and they take thought, effort and personal attention to make them work. 3) We negotiate with people, not companies. Partnerships that last are built through a continuing series of negotiations. Companies don’t negotiate – people do. Traditional styles of win-lose or win-win negotiation tend to focus on the tally sheet between the contracting parties. Working’s message of relationship based negotiations looks at a longer horizon, providing for conflict and compromise but always placing the health of the overall relationship as the highest priority. These are big messages but the best part is they are all wrapped up in one little book. Working is only 88 pages and you can read it cover-to-cover on a short hop from Phoenix to LA. The messages come through the characters as they share their memories and experiences with each other. It’s not just another lesson – it’s a good story. When was the last time you enjoyed reading a business book? Working: A Management Tale of Changing Relationships in Changing Times (2004, CorePurpose Publishing, ISBN: 0-9747056-0-8, $15.95) is available at Amazon.com, Borders.com, and CorePurpose.com or by calling 480.921.3933. As Founder and Executive Director of CorePurpose, Inc., Joan delivers sustainable results by combining the experience, skills and talents within teams to create focused business environments that maximize innovation, growth, profitability and return on investment. With over 20 years of experience in technology distribution, Joan has held a wide range of positions in Management, Marketing, Sales, and Operations. Having a track record for delivering substantial results, she develops and implements solutions to business challenges within smaller, focused organizations and within Fortune 500 multi-national corporations. She was instrumental in the development of Avnet’s ASIC/FPGA business and the launch of Avnet’s first Telesales operation. While directing the Global Supplier Contracts process for Avnet’s three operating groups (Electronics Marketing, Applied Computing and Computer Marketing), Joan worked closely with over 700 technology partners worldwide and is experienced in the challenges and the joys of working in the global business arena from cultural, operational and legal perspectives. With a focus on matching service expectations to operational processes, Joan brings expertise in the area of industry best practices in business strategy, market development, channel design/optimization, and supply chain solutions. An accomplished speaker and member of the National Speakers Association and on the Board of Directors of NSA-Arizona, she has guest lectured at Arizona State University and Texas A&M as well as within the professional community. She is author of Working, and co-author of the first text on electronics distribution, Connecting Resources, A Primer for Electronics Distribution, for use in advanced undergraduate courses and at the graduate level. She is currently working on her next book, Impact – Changing Challenge to Success, scheduled for publication in late 2004. Joan holds an MBA from Arizona State University (2000) and a B.A. in Economics from the University of Delaware (1981). Posted in Company News, News, Publishing and tagged Joan Koerber-Walker Books.